Put your feet up in a relaxing space on No Housework Day with these cool ideas. A spot like this gives you more than enough entertaining space. A regular sized deck becomes cramped with any more than a handful of people but the deck below gives you additional room to roam. This project involved replacing worn decking, railings, stairs and several other features. And there’s plenty of light coming in. This spacious, semi-private deck features planters, a handsome railing, low-voltage lighting and a wide range of low-maintenance, durable materials. It’s a big project, see the full step-by-step plans here. This deck isn’t huge—about 16 ft. wide x 18 ft. deep plus bays and stairs—but it’s big on features. The upper deck is just the right size for entertaining small groups—spacious but intimate. It has cantilevered nooks on both sides that provide space for seating and barbecue storage. The pergola shades the upper deck and the home’s interior from the sun, and it offers a space for hanging or climbing plants. The lower deck is a great place to hang out in the sun, while the cascading stairs flow into the yard and provide lots of space for planters and pots. See how it got built. A screened-in deck offers the added value of keeping away pesky bugs. It can be a great spot as the sun sets for a perfect place to bask in the cool glow of a summer evening. Here’s what we did to build it. This serene retreat offers a unique design and a Zen experience. We’ll show you the plans and techniques it took to construct the pond and deck. All it takes is some digging, simple assembly and this easy-to-follow DIY advice. Rustic steps like these are well suited for informal garden paths like ours, but we wouldn’t recommend them for entry or other steps that get heavy daily use. This is a great entertaining spot or just a nice place to take a breather after working in the garden. Get the full how-to plans for this project here. Retaining walls were built to bring the stone patio up to the height of a deck. Pea gravel got spread over fabric, tilestone was used for the wall and flagstone was used for the steps and patio area. You can imagine a spring afternoon sipping lemonade or iced tea here. There’s nothing quite like kicking back on your own patio—until the sun starts cooking you or the rain begins to fall. Just think—no more rainouts during your next barbecue! And with a roof, you can relax on dry, clean, comfortable, padded furniture, which just can’t stand up to the elements on an open patio. See how we did it. This ground-level deck with pergola and lattice sides makes for a quiet conversation location. Grow climbing plants along the lattice to give the space even more shade and privacy. We’ll show you how to build a latticework trellis for your porch. Imagine inviting neighbors and family over to enjoy this outdoor room, which features a built-in hot tub and a wall-mounted TV. The mood lighting along the floor add to the relaxing atmosphere. Check out these awesome outdoor speaker options. If you have a large window situated between floors in your house, build out the window sill into a space perfect for cozying up with a novel. Make it accessible by adding a ladder! 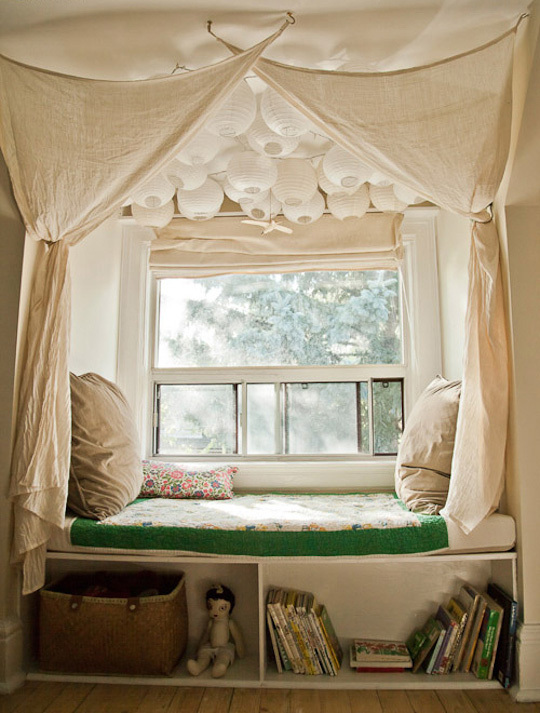 Check out these 11 tips for creating a relaxing reading nook. If you have an existing reading nook that needs to be jazzed up, hang paper lamps from the ceiling and layer canvas drapes to create an indoor glamping site perfect for feeling like you’ve escaped, even in your room! If you love to camp, check out these camping hacks, tips & tricks. If you’ve always wanted to utilize your attic for more than storage, take advantage of the window by creating a cushioned ledge around it for a super cozy and quiet space. Take a look at these other 13 unexpected attic spaces you’ll adore. A super unique reading nook idea, repurpose an old ski chairlift by tucking it in a corner of your home, repainting and adding a rustic bench and table to put your feet up. Draped blankets and pillows add a warm touch. Here’s how to refinish furniture, so you can make that chairlift look just right! The perfect party spot, plus tons of storage. This pub shed features both a shaded patio and bar. And let’s not forget about its storage capacity! Check out more of this super low-key spot. The large door opening on this shed gives you expandable indoor-outdoor space. Just open the overhead door so your party can spread onto the patio. Or roll your workbench outside during dusty jobs. And if storage is what you need, you can’t beat the easy-access convenience of a big door. Check out all the great things of this shed and why it’s a relaxing space. This man cave has built-in beds for when the game runs late into the night. And recreate the look with one of these bunk bed design plans.